Attain GTC SL Disc is a high-performance bicycle that combines comfort and quick acceleration – with the added safety of disc brakes. The Cube Attain definitely reaches new heights for both æsthetics and function. This high-performance race bike combines the comfort and excellent acceleration of a high tech carbon frame with the safety of the latest disc brake technology. Optimising a frame for disc brakes is both art and science. As part of the configuration, there is a 12mm axle system both front and rear to improve rigidity. The forces involved also necessitate a specially designed fork which, together with the Attain GTC SL Disc’s tapered head tube, creates an enormously stiff and precise structure. Cube has also addressed comfort, which is just as important for sustained performance (see our bike page – coming soon). The fork’s carbon blades work together with slender Flex Stays at the rear to help filter out energy-sapping road shock. This reduces fatigue — even on long rides and bad road surfaces. 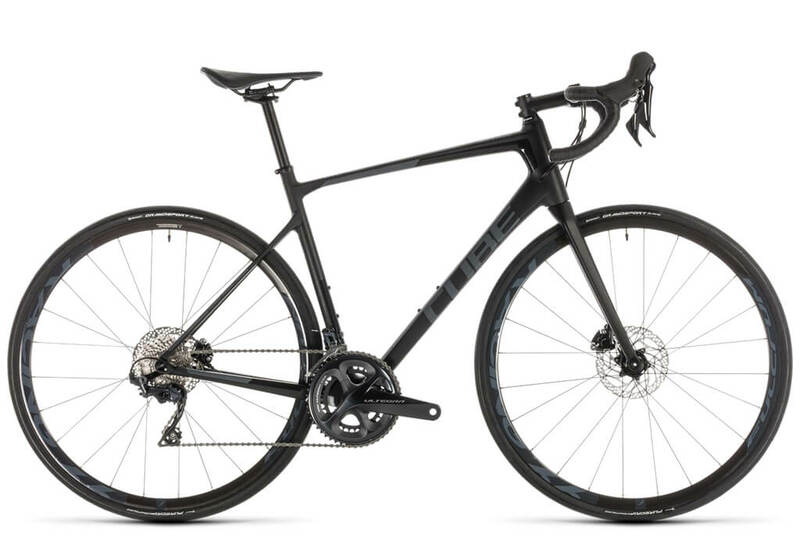 It would have been a crime not to select Shimano’s Ultegra groupset for the Attain GTC SL Disc – and the same goes for the Shimano 105 hydraulic disc brakes. Power is transferred via a compact chainset with 50 and 34 tooth chainrings, while at the rear an 11-speed cassette runs from 11 to 32 teeth. At each end of the bicycle, you get the amazingly fast set of Fulcrum Racing 66 DB wheels, anchored to the road via grippy and fast-rolling Conti Grand Sport Race tyres. The ultimate high-speed endurance machine? The Cube Attain comes close to the mark. The combination of components and optimised carbon frame make this bicycle a genuine long-distance mile-muncher.